ZestPJ dot com and theQguides dot com.. ever heard of these two names? Well, up to a couple of months back, neither had I.
ZestPJ is in fact thePJ Hilton’s blog for its restaurants and bars, and theQguides is a beverage and food website portal. 1. Book online with its QuickBook system. It’s fast, it’s free and they have got loads of great eateries joining their lineup of bookable outlets. 3. You earn free points towards your next free meal. 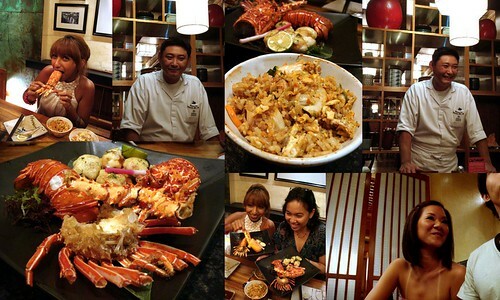 Anyway, this time, Cumi&Ciki were called to review Genji, PJ Hilton’s Japanese restaurant. The other celebs present that night include, Qwazymonkey, LL, Craving Joe, the babes from RedFM and last but not least, the handsome Adly from Fried Chillies! Look at Craving Joe, sniffing the lot he drew. 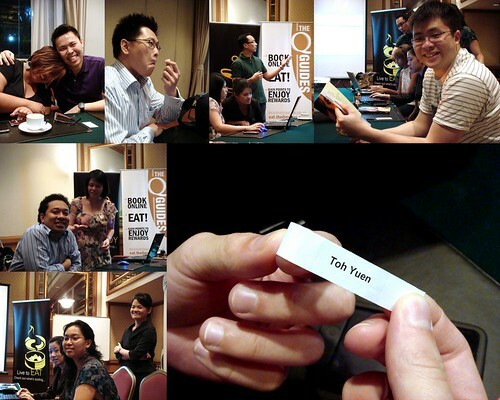 Before we even start the food tasting, we were ushered into Toh Yuen for Mooncake Tasting.. how divine! 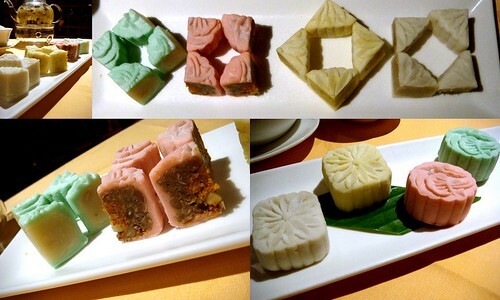 Chef Lee’s new “Four Seasons” mini snow skin mooncakes where each is creatively infused with the season’s freshest bloom! Lotus Spring – white lotus paste mixed with sunflower seeds. Frosty Winter – essentially tasting like vanilla beans and orchids – it will take all your self control not to pop the entire mooncake in your mouth in one go. Genji’s Head Chef Richard Teoh is an interesting man. Apparently he gets his divine inspiration through his yearly culinary trips to Japan and this time we were going to sample his Osaka inspired creations! First up Osaka inspired sushi. 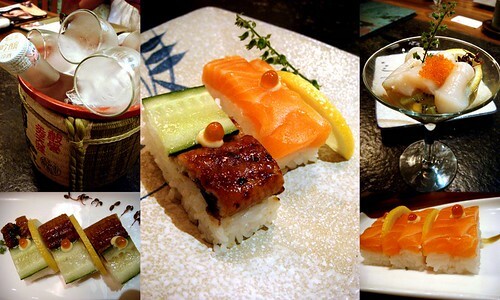 As you can see, they are distinctly different in shape from conventional sushi. They are rectangle. The taste is no less exquisite. The fresh, sweetness of the fish cannot be disputed. A lovely start to the dining experience. The fish is so amazingly succulent that just eating it with simple sauces such as shoyu soy sauce and wasabi are sufficient. 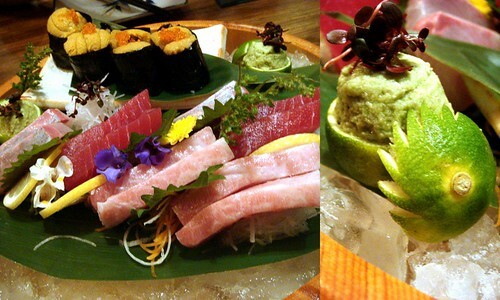 Purists denounce the practice of mixing wasabi into soy sauce, saying that this dilutes the sharp hot flavor of wasabi. The last time I ate a dollop of wasabi in somebody’s soba by accident, I nearly died. Shoyu soy sauce + wasabi for me, thanks! 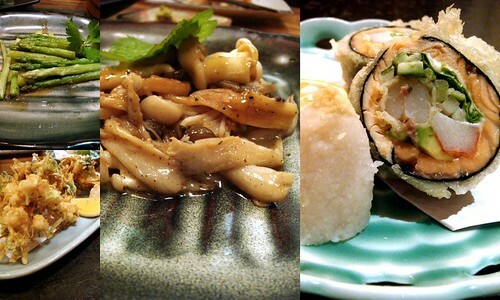 Japanese style sautéed mushrooms, julienne tempura, and special salmon rolls – all Osaka inspired preparations were no less than perfect in presentation as well as taste. As the night progressed, the girls got eating! You can see the progression from cutlery to eating with hands. Of course sucking the marrow/brains and life out of the lobster head is the best.. you agree? The Head Chef, then wow-ed us some more, with his exciting tales of food and travel. What an interesting, talented man. Where did HE come from..? I think he must have snuck in, inside the hair-bun of that babe from RedFM! 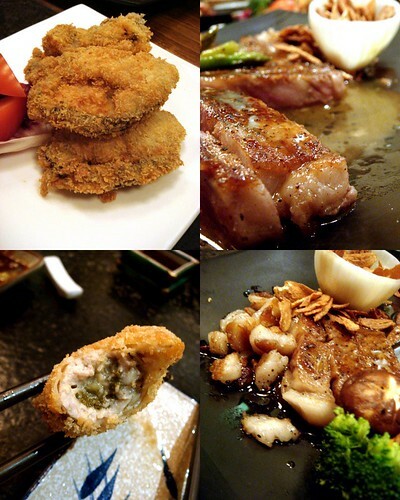 Finally, the chef’s Pièce de résistance.. the amazing deep fried battered oyster and the Kobe Beef. Both equally unique in taste, both equally good. Thank God we reached the grand finale of the night.. just at the same moment the battery in my Sony decided to go kaput..
Anyways, all in all a great night. The next day, I checked my email and saw that theQguides had sent out an email thanking me for my participation the night before, at Genji and asked me for my feedback on the restaurant I had visited. This counts for the free points I can earn towards my next free meal. So guys and gals, don’t forget to log on to theQguides the next time you want to book dinner for two or three or four.. etc.. the more the merrier! ** also a big thank you to the Manager Amos for the way he arranged our meal so splendidly. Cumi has a big belly to show for it now. Cheers! whoa!! 2nd round wor! some more can picked Genji! 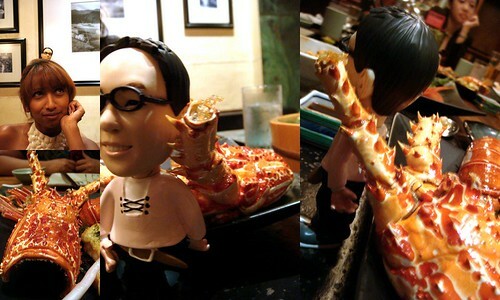 superb creative food-it is a knockout! I can honestly say… I don't think I've seen such an indulgent spread of Japanese food before… you fellaz really ate well that night. Amos really took care of you.